Cinderella’s shoes were cute and all, but if my Fairy Godmother had flown down to deck me out for the party of the decade, I would have wanted some input in the design process. I freely admit to being a control freak when it comes to clothes (and shoes, bags and jewellery) and I know Cinders was just relieved to be out of her holey flats… But the chance to own a pair of bespoke shoes is the dream so why not have a say on their design too? 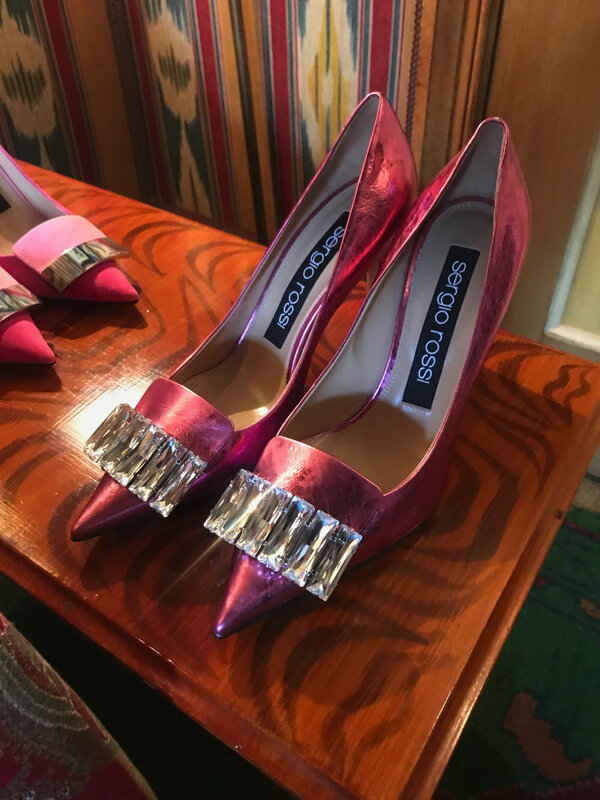 While Sergio Rossi don’t actually harness the power of magic, the Italian brand’s exclusive customisation service does come pretty close. My inspiration session came at the top of 5 Hertford Street in a cosy club room, where a myriad of signature SR1 flats and courts - in all the colours of the rainbow - were spread out before me, along with a slick vanity case full of leather uppers, metal trim samples and monogram examples. I just had to make my mind up about which silhouette, metal, colour, material and whether I wanted to add diamante details or a monogram… How long have you got? Time was tight and I’m indecisive at the best of times so I decided to play with the process online. As well as popping into the brand’s flagship stores to design a pair, you can do so online too. I decided on flats… or heels… purple suede… no, pink… rose gold or pewter… Finally I wrapped up and settled on these, mint snake print flats with pewter trim. Chic but edgy and they go brilliantly with jeans. Once finalised, the design wings it’s way to the Milan factory before alighting on your own feet. Where you go in the shoes is up to you but remember, a good pair of shoes can change your life. Ask Cinderella.